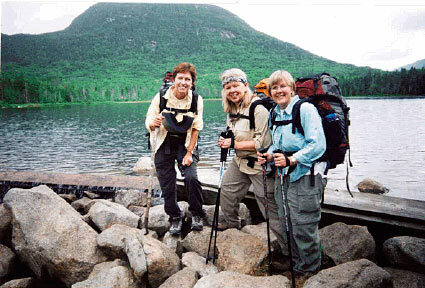 In 2003 my 2 high school girlfriends (class of '68) and I made plans to hike a part of the Appalachian Trail. We were inspired by Bill Bryson's book "A Walk in the Woods", which is a humerous account of the author's experience hiking the Appalachian Trail. We weren't really interested in sleeping out under the stars or lugging a huge backpack so we decided to follow the AT in the White Mountains and sleep in the huts that are spaced a day's hike apart. The huts are operated by the user-friendly Appalachian Mountain Club (www.outdoors.org). Reservations are taken beginning in November for the following year, and because they fill up fast we called on the opening day to reserve our bunks for the following August, 2004. We booked the huts for 7 consecutive nights beginning at Lonesome Lake hut, hiking west and finishing at the Madison Spring hut. All 7 of these huts are full service huts, furnishing a full dinner & breakfast which is included in the price of the bunk (now around $87 a night). Because of the hut's meal service, beds, & blankets, our backpacks would be lighter since we could dispense with tents, sleeping bags, cooking equipment & most food. However, because of the White Mountain's extreme weather conditions, we had to pack alot of clothing to layer; hats, gloves, long underwear, rain gear, & jackets. Actually our packs still weighed in at over 20 pounds! To get into shape we spent several months prior to the trip hiking with our backpacks loaded with weights, going up & down the hill at Fort Meigs Fort (the only hill in our flat part of the country!). That August we flew into Manchester, NH & rented a car for the 125 mile drive up to Pinkham Notch. For the first and last days of our trip we had reservations at the Joe Dodge Lodge at Pinkham Notch Visitor Center. The lodge is clean and comfortable with shared baths, a supply store with very knowledgeable clerks, and a cafeteria-style restaurant. There is a shuttle bus that stops at the lodge and at each trailhead, & stays on a strict, published schedule. It is also a good idea to make reservations for the shuttle in advance. Our first day's hike began at the Lafayette Place campground & ended fairly early in the day at Lonesome Lake Hut. It was a good first day hike; with only a 750' elevation gain & not too rugged or difficult. Lonesome Lake is the only hut that has separate sleeping cabins apart from the dining lodge. There is no heat in the cabins so we used every blanket we could find that night as it got very chilly as soon as the sun set. The second day's hike to Greenleaf Hut was a lot more strenuous & involved some steep rock climbing in the area called they call "The Agonies". The views along the way are definitely worth this climb up Mount Lafayette. After dark we were treated to a fantastic night sky filled with the brightest stars I've ever seen. Greenleaf Hut (as most of the huts in the AMC system) have large bedrooms in the lodge filled with bunks stacked 3-4 high. Although you may find yourself sleeping next to a record-setting snorer, nobody seems to have any trouble sleeping at night probably due to sheer exhaustion! Our 3rd day's hike was to be from Greenleaf to Galehead hut, and we were told that it would be an even more strenuous than the hike up "The Agonies". My girlfriend was nursing a sore hip & was unsure about attempting this difficult rated trail. No problem; the friendly young staff at Greenleaf made a call to reservations and we were able to transfer our next night's reservations from Galehead Hut to Highland Lodge at Crawford Notch. After a restful night (& shower!) at the comfortable Highland Lodge, we hiked to the trailhead & then up to Zealand Falls Hut the next day. It was a beautiful, fairly easy hike along a mountain stream & falls. Right outside Zealand Falls Hut the hikers relaxed on the large flat rocks along the falls; reading, napping or just chatting with fellow hikers. We made some friends at the huts because you see many of the same folks every night, including some Appalachian Trail "thru hikers". The "thru hikers" earn their meals & bunks (or table tops if beds are all bunks are taken) by cleaning up after dinner and by sharing their trail experiences in the evenings with the guests. The college kids who prepare and serve the meals put on short skits or musical shows before every meal, and show much joyful enthusiasm in everything they do. Just about everyone we met on the trail or at the huts was friendly and eager to talk & to share their hiking experiences and knowledge. The 5th day we continued our hike to Mitzpah Springs Hut. Mitzpah Springs Hut is at 3,800' up on the side of Mount Washington. No rock climbing on this trail but fairly steep climbs up the forested mountainside. That evening after a delicious lasagne dinner, we talked about the next day's hike up to Lakes of the Clouds Hut. It sits almost on the top of Mount Washington at 5,050' & the hike is rated "difficult" by the AMC. Lake of the Clouds Hut is aptly named because we hiked all the way there in a complete fog, unable to see the hut until we were literally at the front door. It was too foggy all day & evening to explore or wander around outside, so everyone sat inside reading or playing cards. The next day on our hike to Madison Spring Hut the weather finally cleared up & the views were absolutely stunning, especially from Mount Adams looking across the Great Gulf Wilderness to Mount Washington. Madison Spring Hut is the smallest and most rustic of all the huts, but probably the coziest. The final day was hiking down to the trailhead in time to meet the shuttle & ride back to Pinkham Notch. This trip was so exciting & challenging that I'd love to go back one day & repeat the hike, maybe doing it in the opposite direction. I would say it's a very safe hiking trip for ladies only as there are many hikers on every trail who are eager to assist if needed. However, you do have to seriously prepare ahead to avoid injury and to be sure you are properly outfitted to handle inclement weather. We kidded each about the hypothermia but it is a real threat to hikers in that area.